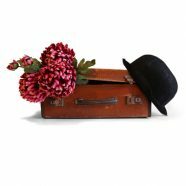 First performed at the Citizens Theatre over two decades ago, Giles Havergal’s stage adaptation of Graham Greene’s Travels With My Aunt has returned home. The title says it all: retired bank manager, Henry Pulling, leaves his predictable life to join his septuagenarian Aunt Augusta on a whirlwind of adventures. Director Phillip Breen leads the ensemble of four, who each play Henry Pulling in different instances with much clarity. Ian Redford effectively captures the spirit of Aunt Augusta’s zest for adventure that exudes from her portly frame, Joshua Richards transforms as Augusta’s drug-dealing lovers, Wandsworth and Visconti, and Tony Cownie clearly enjoys playing a young American traveller and her father. Ewan Somers, who without uttering more than ten words, remains a necessary presence through embellishing the narrative as a dog, lamp and an uncouth young woman. In spite of a strong cast and set designed by Mark Bailey that is both efficient and poetic, the energy of the play does falter on occasion, perhaps due to the fact that nothing visually engaging builds with the tension of the adventure. The performance concept milks itself instead of transforming with Henry Pulling’s attitude towards the meaning of life, and the last fifteen minutes of the show can be presented in a more concise manner to save itself from multiple false endings. All being said, Travels With My Aunt is another relevant example of how stories of the sixties remain alive to those that lived through the era, and resonate no less with the new generation.